Slush itself was well organised thanks again to Timo Airisto and his partnership this year with Aalto Entrepreneurship Society under the guidance of Miki Kuusi and his team. The new layout of keeping all the action in the main hall made for a great atmosphere. You could quickly review a number of startups presenting their companies and products/services at their stands, nip over to see startups pitch on the other side of room, grab a coffee and head down to listen to world class keynote speakers. The ground work for all this progress has been set some years back with both Timo Airisto & Peter Vesterbacka putting in a lot of effort to encourage entrepreneurship. They certainly can see the results of their efforts paying off, but we are sure they already have set the next goal even higher. If you missed Slush you missed the chance to witness Finnish Startups set out on the road to growth. 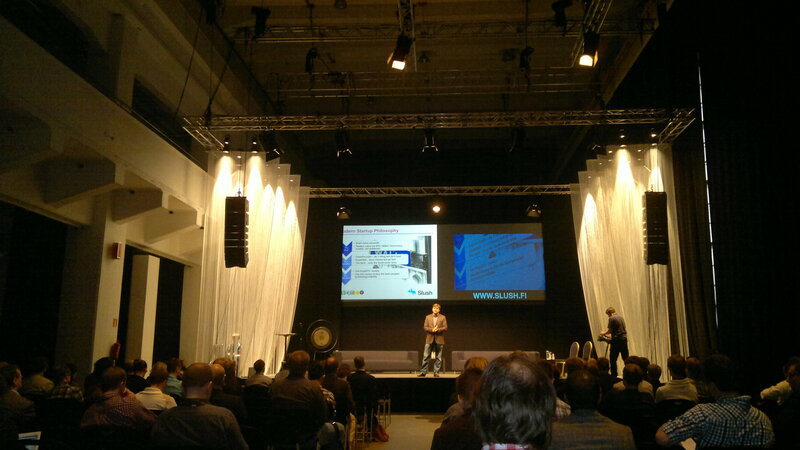 View the Slush 7 winner Ovelin’s product Wild Chords from the video below. A big thank you to Timo for providing us with free tickets. If you are interested in entrepreneurship join one of the entrepreneurship societies today. Join MetropoliaES on Facebook. Next Post Celebrating the Golden age of Creativity NOW!